Baboons in the wild are known for their highly strategic and hierarchical societies. So when it comes to decisions about where to go, one might expect that some bolshie individuals will direct the group through its habitat. However, a new study of the collective movements of wild olive baboons in Kenya suggests that there are more democratic processes at play. For wild animals location is everything. The decision to head north instead of south may lead you to a fruiting tree, a pool with water or a place of shelter: all of these things could be the difference between life and death. For that reason, animal movements are never random. Even when searching for things, animals will use specific patterns of movements to sweep their environment. Social animal species like monkeys may not sit down and have a confab over a map, but they still need to make a decision about where the group should be heading. A baboon in sheep’s clothing? Numerous theoretical studies show the more you use collective information, the better the decision making process turns out. So it actually makes sense for clever animals like baboons to ignore a dominant individual no matter how much of a despot they are, but instead use a democratic process. Oliver might be resourceful but look at that silly stroll. He clearly has no idea where he’s going. So far, there has been a limited amount of knowledge about how baboons make decisions about movements. The problem is how to study simultaneous and collective decision making in animals that live in large groups. Baboons typically live in groups of around 100. High accuracy GPS devices mounted on the majority of group members is the answer: this will reveal how animals coordinate their movements relative to one another. I have used this technique in the past on a much smaller scale to investigate the secretive lives of mated pairs of maned wolves in Brazil. The researchers monitoring baboons in Kenya did just this. When an animal moved off, its influence on the other members of the group was observed. Did the other members follow (that is, did it “pull” them along)? Or did the other members resist the initiative to move off (that is, “anchor” the group). And what happened when several individuals moved off at the same time in different directions? The researchers found that there was no relationship between position in the hierarchy and pulling the crowd along. 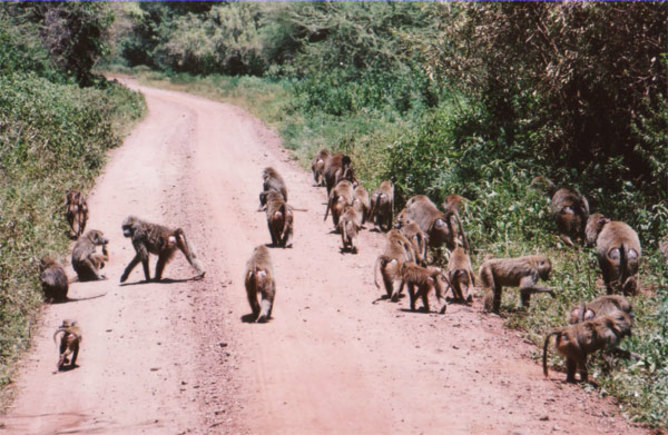 In other words, top baboons were as likely to be followers as being followed. This illustrates that leadership and social roles within a social group can be distinct roles. Just because you are the leader does not mean that everyone else in the group treats you like you are infallible in your decision making. In general individuals were followed when they moved purposefully off in a set direction and were able to rapidly recruit or “pull” other individuals in that direction. This makes sense in that it suggests to other group members that the moving individual’s behaviour is goal driven, for example by looking for food. Perhaps the individual has suddenly remembered the location of a fruiting tree. It would therefore appear that baboons like to follow the crowd – this is similar to quorum sensing behaviour in bees and ants when they are choosing a new nest. The option with the most votes wins. A big problem of group movement is how to resolve disagreement about the direction to be taken. It is rather like being lost in a strange city on a night out with a group of friends with widely differing opinions about where to go. One effect of this for both humans and baboons is that it delays any decision being made as the conflict is being resolved. So what’s the solution? It turns out that baboons have a special rule. When the difference between two individuals trying to initiate movements in different directions is less than 90 degrees from one another, then it is resolved by splitting the difference and taking a middle path. However, if the difference of opinion about directions is greater than 90 degrees then individuals accept the choice of one individual over the other. Initiators of movement in a certain direction build up followers, and the individual that has accumulated most followers will end up determining the group’s direction. You are wrong – the difference is 91 degrees, not 88. Let’s follow Jack. 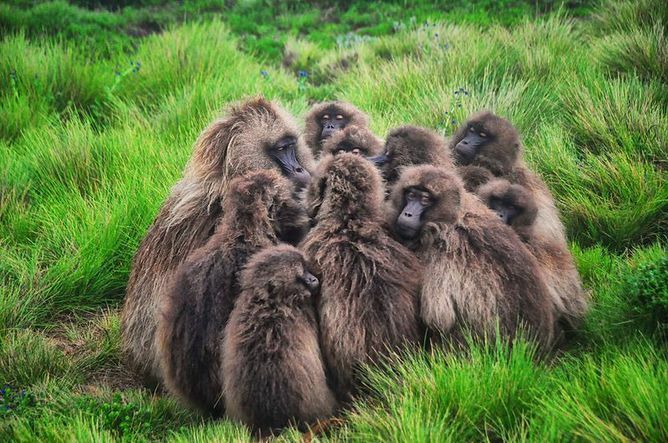 It is surprising that something as important as group movement in baboons can be determined by a few simple rules, which are based on the idea that it is better to use the group’s collective knowledge than trust in the opinion of their leader. And perhaps even more so the fact that a dominant individual accepts that it is better to be a sheep than a shepherd in certain situations.